Microscope Imaging Station. Blood:The body�s vital defense force. A tattoo lasts a lifetime, thanks to your white blood cells. Watch and listen as researcher Mike McGrath explains how these warrior cells protect you from disease�and keep body art intact. Ouch�you�ve cut your finger! A familiar red substance oozes out. As you reach for a bandage, take a moment to ponder the vital role this remarkable fluid performs. Blood feeds your cells, kills off invaders, and will soon begin healing that wound. It carries every substance on the move within your body�oxygen, vitamins, drugs, hormones, water, and nutrients from your last meal. What�s in your blood varies from hour to hour, and its components can be read like a report card, offering volumes of information on how your body is functioning. In many cultures, blood is a powerful symbol or talisman, capable of giving life, purifying objects, and placating the gods. Shared blood is considered the strongest of bonds between people, and shedding blood is the ultimate sacrifice. Blood is certainly central to our survival, an organ we can�t do without. It�s the second most common tissue in the body (skin being the first), and comprises about 7% of a �s body weight. When you think of blood, you probably think "red." Red blood cells (RBCs) are by far the most common cells in your blood, but they are only one of over ten types of blood cell. RBCs carry oxygen from your lungs to your tissues, using a protein called hemoglobin. Hemoglobin, which binds oxygen, contains iron, the element that gives blood its familiar crimson shade. 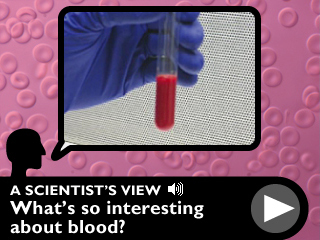 All animals use blood cells to transport oxygen, but not all animals' RBCs are the same. Humans make RBCs in their bone marrow. Before the cells enter the bloodstream to do their job, they lose their nuclei, which keeps them from dividing. When your body needs more RBCs�they wear out and die after about 120 days�your bone marrow must produce them. Birds, on the other hand, have hollow bones without marrow. Their RBCs retain their nuclei, and therefore can reproduce by dividing. The shapes of RBC differ between animals as well. Human RBCs are doughnut shaped, while those of some other animals, like camels and penguins, have a more oval appearance. Whichever shape they take, an important characteristic of RBCs is their flexibility: their shapes make them pliable enough to squeeze through the tiny capillaries where oxygen is exchanged for carbon dioxide. The average adult has 5-6 quarts of blood. In one day, your blood travels nearly 12,000 miles. About half of your blood volume is water. The cells in your blood have a variety of lifespans. But blood contains other types of cells as well. About one percent of the cells in your blood are white blood cells. These make up the most important part of your immune system. Unlike RBCs, WBCs can leave your circulatory system and move out into other types of tissues to fend off invading bacteria and viruses. They rush to the site of an injury (remember that cut on your finger? ), seek out foreign cells and particles, and engulf them. There are many different types of white cells; some live less than a day, but others stay with you for much of your life. It�s worth marveling at the scope of your white blood cells� effectiveness: every day, you�re exposed to thousands of germs�bacteria and viruses�but the vast majority never succeed in infecting you. An invading cell does slip through just about every other day. But thanks to the quick response of your immune system, you actually get a cold or flu far less often than that. When you do get a cold, you usually get over it in a few days. That�s your immune system at work, too. (Without it, you�d constantly have a runny nose!) Just as there are different types of WBCs, there are also many different types of invading bacteria and viruses. But your white cells form an agile and adaptive swarm keeping this ever-changing set of microscopic trespassers at bay.